Mooney-General Paper has the right product for your application. Structural Adhesives-Designed to carry the load. Instant (Cyanoacrylate) adhesives: These high strength liquid formulations are commonly known as instant adhesives. On rigid plastic, glass, metal, rubber and other low porosity substrates, they harden in seconds by reacting with surface moisture . Polyurethane Reactive (PUR) Adhesives: These systems combine many production benefits typical of hot melt adhesives and bond performance usually associated with two-part structural adhesives. One-component, moisture curing formulation eliminates metering, mixing and curing equipment. 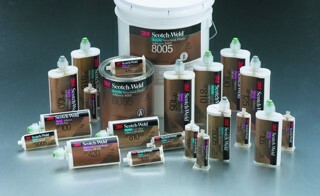 And 100% solids give you a low-VOC adhesive system with no drying equipment and no attack on plastics. Two-Part epoxy adhesives: Two-part liquids and pastes. These provide the highest strength and elevated temperature resistance. Two-Part Urethane adhesives: Generally lower-cost, two-part liquids and pastes, urethane adhesives cure quickly to an elastic bond. They’re ideal for applications requiring flexibility between dissimilar materials and where impact resistance is key. Two-Part Acrylic Adhesives: These two–part liquids and pastes are designed to bond the widest variety of substrates, Including hard-to-bond plastics and oily metals. You get an exceptionally high strength bond without the surface preparation usually required for epoxies and urethane’s. Non-structural Adhesives- Non-structural does not mean weak. Hot melt adhesives: As the name suggests, these adhesives melt and flow when heated to wet the substrates and bond quickly upon cooling. Products are available that can be sprayed and come with a variety of other useful characteristics, such as short set times and permanent PSA properties. Applications range from sealing to bonding automotive interior trim. Aerosol adhesives: Aerosol adhesives are portable and ready to go at the touch of a finger. Select from a wide range of job-related formulations–various performance and application characteristics for production and maintenance jobs. Cylinder spray adhesives: High performance adhesives in pressurized cylinders offering the convenience of an aerosol with the productivity of a bulk system. Contact bond adhesives: Solvent- or water-based adhesives available in a variety of open times, these useful adhesives are usually rolled, brushed or sprayed on the two surfaces to be bonded and allowed to dry to the touch. Substrates bond almost instantly when the surfaces are pressed together. Fasteners-An Open-and-Shut Case: The modern age of design and manufacturing requires new ways of securing, attaching and connecting different surfaces. From the brief moment a golf glove must adhere to a golf club grip, to the few hours a trade show facade must stick to a booth frame to the eternity an access panel must stay closed, but quickly accessible. Only 3M™ provides the widest diversity of fastening solutions – from a moment to forever. Hook and Loop: Made up of two woven strips-one covered with stiff hooks, the other with pliable loops- hook and loop fasteners instantly secure items in place.Yet, when you want to remove or reposition an item, hook and loop fasteners easily pull apart. With no mechanical parts to wear out, you can trust hook and loop fasteners to hold strong and open easy up to 5,000 times. Available with pressure-sensitive adhesive backing or plain backing for sewing or stapling. Dual Lock: reclosable fasteners can solve your design dilemmas—replacing screws, bolts and rivets as a tool-free, seamless fastening system. The industrial fasteners work similarly to hook and loop products, but offer five times the holding strength and are still lightweight. They have interlocking mushroom-shaped stems that “snap” together for strong fastening on one side and adhesives to securely adhere to various surfaces on the other. Bonding Tapes- Where convenience meets extreme bonding power. Enhanced appearance, better performance, faster assembly times…if these benefits can help you bring a higher quality, more competitive product to market, then it’s time to evaluate the many pressure-sensitive adhesive bonding tapes from 3M. Pressure-sensitive adhesive on two sides bonds substrates from metal to paper with amazing strength, from permanent and structural to permanently repositionable. Each tape represents more than 50 years of 3M leadership in providing design and production engineers with innovative adhesive formulations. Please see our TAPES page for more detailed information.